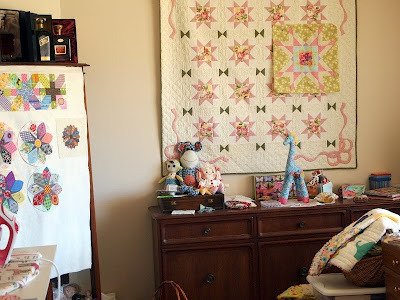 I have been quilting 16 years and have never had a design wall - now don't laugh! it is only tiny and covers up my dollies in the cabinet but I DO have a Design Wall! Just playing yesterday, I decided I would do a few more x and + blocks (I have mislaid the others!). Then I decided I really needed a design wall. See that little elephant there lower right-hand corner, I must finish the binding tonight, well maybe tomorrow.Very messy studio, but you must admit that design wall really gives it character! Happy day! I love your design wall Lurline! It is more than I have ha ha. Love all the blocks on it too. Glad to see your posts. My son sent me a flanel sheet and I am still trying to figure out where I can hang it. I really want to get my x and + blocks arranged. Well, really, it was you that got me started on these and I want to see how yours will go together so you better hunt them up. Nice to have a design wall for sure -- wish I had one. lol! Love what's up on yours -- so pretty! Nice to see the elephant quilt peeking out too. That is not a messy sewing room.....heck I still see some horizontal surfaces to cover! 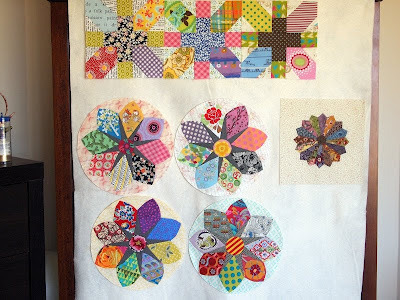 I do love using my sewing wall.......sometimes though things get "stuck" there and never finished. I think your design wall is fabulous. Very insiring. I've been making a few dresdens of my own and the x and + blocks are on my list. Never worry about a messing studio. Creative clutter is better than tidy idleness. 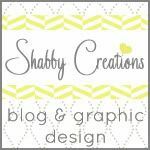 I truly can't imagine life without my design wall. :) It really helps me see the whole picture. Love those circle blocks. Your stuff never fails to captivate me. My first wall was a piece of foam board that I moved from place to place because it didn't have a home wall. Now I have one whole wall but have trouble because things seem to want to pile up in front of it. But I love being able to see what I am working on and play with placement until it is "just right," Love you wall and blocks. You are an inspiration. All the blocks look beautiful lovely fabrics they need to be displayed. It is fun being able to change things around.I have 1 small wall I use with left over wadding sewn together over a curtain rod. Like Gari I also find I stack a little pile in front of it at times. I doesn't matter if it gets a little messy it looks industrious. 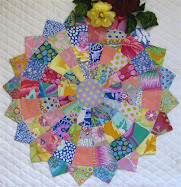 Great idea on your design wall - what fabric did you use?